The team here at MAXRPM includes only the best and brightest automotive professionals in the area. We are factory trained and committed to quality, service & excellence. Owning the hottest performance shop in the Pacific Northwest isn't just a job to me — it’s my life’s passion. Aaron is a Master Technician who graduated from UTI with a 4.0 GPA. He specializes in performance engine building and ECU tuning. When he isn't at the shop, he enjoys backpacking, photography, and brewing beer. The friendly face at our front counter, Stephen has been in the automotive industry for over 20 years. Born and raised here in the Pacific Northwest, a true local. 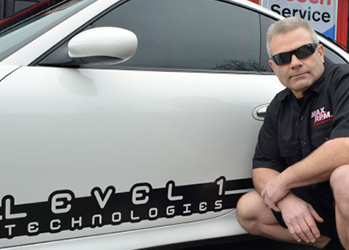 Tim is a Master level technician who also has over 14 years of experience across several manufacturers. His hobbies include building and riding motorcycles, and playing guitar. Micah is an industry veteran with over 25 years of active automotive experience. His expertise ranges from sales to management and all points in between.